Five Things Friday: Christmas Tree Decorations | Keeps Me Out Of Mischief! Today I’ve spent a happy hour in B&Q’s Christmas department with my nephew. It was a cold and rainy day and we didn’t fancy going outside but we had to get out the house before he went mad! He was in heaven looking at all the pretty lights and seeing what the moving decorations would do when he pressed a button. I didn’t really like any of the Christmas trees that they had on display, they all looked too ‘perfect’ with their matching decorations. I love homemade decorations on a Christmas tree, it makes it look so much more friendly and inviting. 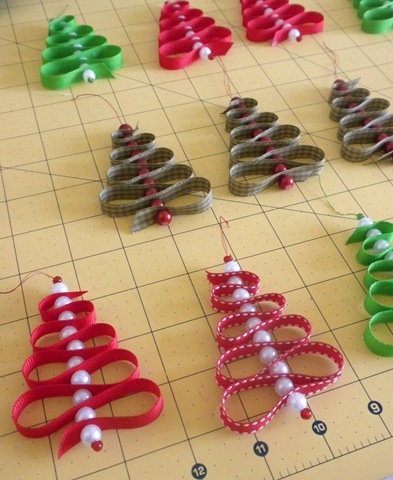 Here’s some inspiration for handmade Christmas decorations. 1. A Squirrel Knocks on my Door has this idea for clay pot snowmen. 2. Sarasota Mom’s Spot shares these felt decorations. 3. 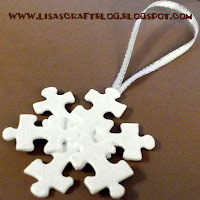 Lisa’s Craft Blog has this idea using puzzle pieces – a great way to use up jigsaws with missing pieces. 4. 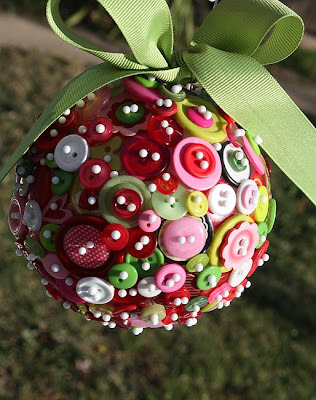 Blue Velvet Chair shares this idea for a button bauble. 5. This idea using ribbon and beads is shared by Sunshine Yellow.